32 (36.5, 40, 43.5, 48, 52, 55.5)” bust/chest circumference. 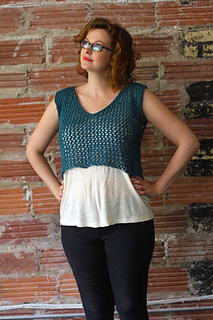 I love light layers for the hot weather, and Beach House is perfect for that! Its positive ease and mesh means it’s breezy and great for pairing with a pretty sundress, strappy top, or even swimwear. 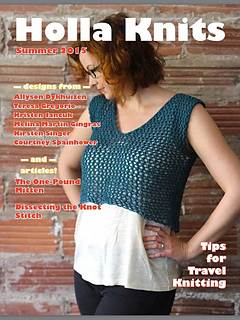 This knit is quick, takes up very little yarn, and is SO MUCH fun! It keeps you on your toes with short rows, pleats, and some shoulder grafting. This seamless bottom-up design dips in the back and curves up in the front to hit at your natural waist. Select the size that is 3” larger than your actual bust measurement. 32 (36.5, 40, 43.5, 48, 52, 55.5)” bust/chest circumference. 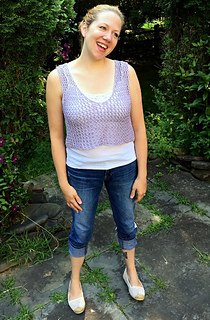 Pullover in Knit Picks CotLin shown in 36.5″, and in Voolenvine shown in 43.5”. Knit Picks CotLin, 70% Tanguis Cotton, 30% Linen; 123yds/50g: 24464, Harbor, 3 (3, 3, 4, 4, 5, 5) skeins. Voolenvine Yarns Smitten DK, 80% Merino, 10% Nylon, 10% Cashmere; 231yds/100g: Beach House, 2 (2, 2, 2, 2, 3, 3) skeins. Size 8 (5 mm): at least 16″ length circular (cir). Adjust needle sizes if necessary to obtain the correct gauge. Markers (m); stitch holders or scrap yarn; 2 spare double pointed needles (dpns), tapestry needle. 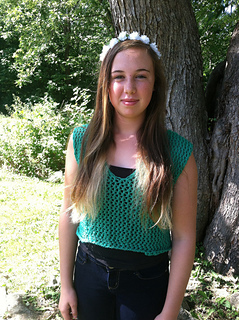 14.5 sts and 20 rows = 4″ (10 cm) in Mesh stitch after blocking; 18 sts and 32 rows = 4” in Garter stitch after blocking. 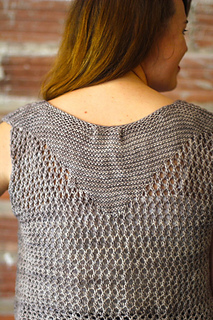 The Mesh stitch lays open and drapes wonderfully through aggressive blocking. 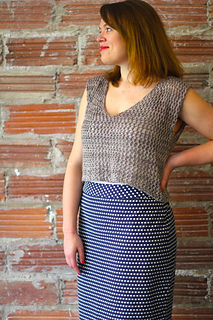 MAKE SURE you measure your gauge on a BLOCKED SWATCH. Otherwise, you will not achieve the size you want through the directions as written.